I think one of my favorite things about drawing the Blob is that he really doesn’t have hands or legs or anything—so the idea that he has to come up with creative ways to get food, make art, etc. is extraordinarily amusing to me… No, it’s not sick or sadistic, because it’s a Blob; he isn’t some traumatic amputee. He just has no limbs. As far as food goes, I’m not the biggest fan of fondue and how it tastes, but I love the concept. I do love cheese, so maybe just all the fondue I’ve had has been icky? Although, The Melting Pot is a super fun place to have dinner (I just don’t want to pay seventy dollars to dine with someone). Here’s hoping your fondue is never icky. 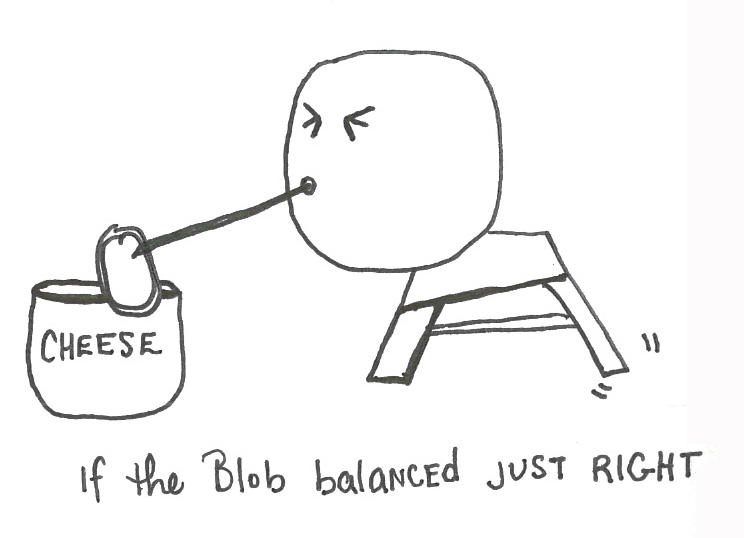 This entry was tagged Arts, Balancing, blob, Fondue, Food and Related Products, household objects. Bookmark the permalink.